making and much more. Because of its ground-­breaking success as a critically­ acclaimed shooter, discs upon discs were released by various third­ party companies, offering more levels, more content and map­making software for all to use. Unfortunately, most of them were large collections of dreadful maps downloaded from the internet, compiled together illegally without even asking id Software for their permission. Hell to Pay, released in 1996 by WizardWorks and developed by Wraith Corporation, is a totally different story. Surprisingly, the expansion pack had a strong emphasis on the story. Two­ hundred years after the tragic events of Doom II, global peace is declared on Earth. Two­ hundred years later, a wormhole suddenly opens, releasing Hell’s army upon the unsuspecting planet. Whilst the planet was heavily defended, the monsters that attacked enslaved the population with ease. As a lone marine sent off to the cells, you overpower the guard and start a revolt against the invaders, soon taking the fight to their home. During intermissions between levels, the player is updated with pictures that add information and details to the engaging plot. Too bad nothing could be done with the default Doom II intermissions which appear, since they were programmed into the game and could not be removed or rewritten. Not only does it offer nice new textures, from switches and laser gates to stereos and starry skies, but it also includes sprite ­swaps for certain enemies, weapons and decorations. For instance, Pinky demons are now mechanical terrors with multiple blades, and the imps have got themselves some light armour and some tridents for hands. 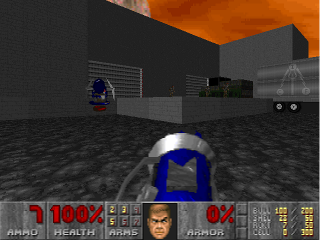 Even the plasma gun and BFG9000 have been sprite-swapped to look like a blue and red trident with different particle effects. Admittedly, a few of these sprite­ swaps do look a bit grainy in quality, and even though they function the same as before, they are still nice features. 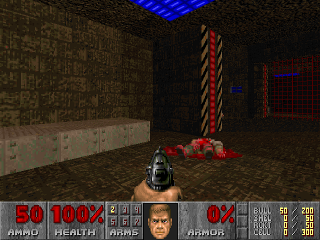 The objective of the game is the same as before: shoot to kill and escape each level. Hell to Pay boasts some remarkable level designs, featuring laser walls which can be deactivated, a large crane, zero gravity, a giant mixer full of gore, and more. These kind of things were near­ impossible to do in the original Doom engine, and added some great twists to some of the maps. One level, for instance, entitled Self­ Destruct, requires the player to destroy all four fuses to reveal the exit, before the timer reaches zero and blows the base to pieces. There are no secret levels in this add­on, however, since players are automatically sent to them after beating the fifteenth level. Not only that, but some of the later levels in Planet Hell become much smaller and a bit dull compared to before, yet its difficulty curve will definitely keep you on edge. Bonus points can be given to its new soundtrack, as well. Its infectious beats and guitar strums will either add that ominous feeling to levels or will make blasting away at the mechanical terrors all the more satisfying. The new sounds for enemies fit as well. Perhaps they could have given some better sounds to the sprite­ swapped Plasma rifle, something less ear­ wrenching when you continuously fire it. Without a doubt, Hell to Pay is the best add­on pack ever released for Doom II. Its brilliant levels, music, sprite ­swaps, textures, plot, and ways of pulling off the impossible with the Doom engine makes it a real stunner, with thirty­ two levels of action ­packed mayhem that are a blast to play, whether fighting solo, cooperative or in a death­match. It can download the 15­ level demo online, since the Doom community to this day is still thriving, strong as ever, yet finding a copy is none too easy these days. In the end, it’s totally worth it.